The following news story on companion laser therapy originally appeared in the South Lake Tablet and is reprinted here with permission. Photos are courtesy of © South Lake Tablet and taken by Photographer Mike Corradino. Veterinary medicine has seen the light, literally. While treatments for many conditions using light have been around since the ancient Greeks, recent discoveries using laser light treatments have recently become an accepted alternative to more invasive methods. 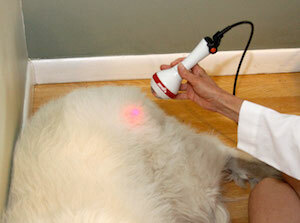 Dr. Joell Sheahan of Mobile Vet to Pet has begun using lasers. Lasers can treat more than 80 conditions including pain, inflammation and wounds . Class IV low light lasers have been tested for therapy in animals and humans and are backed by 30 years of research. The University of Florida Veterinary Hospital has been using lasers in treatments for some time. “I primarily use the laser to help reduce pain and swelling,” Sheahan said. “Sometimes using the laser allows me to get at the problem and put medicine where I couldn’t before due to swelling by increasing circulation to treated area. Because it is non-invasive, pets stay calmer. 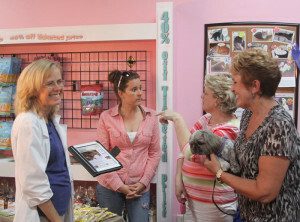 “Pets usually feel a slight warmth in the treatment area. A recent cat patient with an abscess had amazing improvement after just one treatment,” Sheahan said, but added that each condition varies and it may take more than one treatment to resolve the medical issue. The way the laser works is it deeply penetrates the tissue without damaging it. The laser’s energy triggers a biological response in the cells called “photo bio modulation” which reduces the pain, inflammation and increases the speed of healing according to research. “Inflammation is caused by the release of histamines, enzymes and degranulation of cells.” When people itch, we are generally smart enough to stop. Animals don’t always do so, and they scratch until they traumatize the area, i.e. a hotspot. 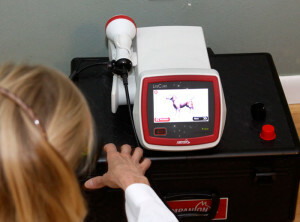 After Laser treatment they get almost immediate relief and the area starts healing,” the vet explained. Getting the word out about medical treatments with lasers has been the mission of the American Institute of Medical Laser Applications (AIMLA). Because laser therapy is an accepted practice for people and pets, most pet insurance plans will pay for the procedures. “Some animals need only one treatment,” Sheahan noted, “In acute conditions it may be one or more depending on the condition. Chronic conditions, like arthritis will require multiple treatments and then follow up with maintenance. It’s a drug free, surgery free relief and can be a desirable holistic alternative to drug and/or surgical treatment. To learn more contact Dr. Sheahan at 352-978-0494 or click here to contact her online.